The latest Expansion pack, Destiny Rise of Iron is out now. This new Destiny Rise of Iron DLC features various new weapons, armor, gears story missions and quest and a lot more new and exciting things such as Strike and Raid. Today in How to Get Young Wolf’s Howl Sword in Destiny Rise of Iron guide we will show you how to get this Young Wolf’s Howl exotic sword in the Destiny Rise of Iron DLC. The Young Wolf’s Howl Sword is an exotic sword and it is part of Iron Lords Gear. If you know where to look you can get it really early in Destiny Rise of Iron. Young Wolf’s Howl Sword has two different ornaments that can be used to change its appearance. Fortunately, you can not miss Young Wolf’s Howl Sword, you will get it for completing Rise of Iron quest-line. When you finish the final quest in this story line you will receive this exotic sword as a reward. The best part is that you will not have to gather resources or materials. If there is no space in your inventory just make sure to check postmaster. 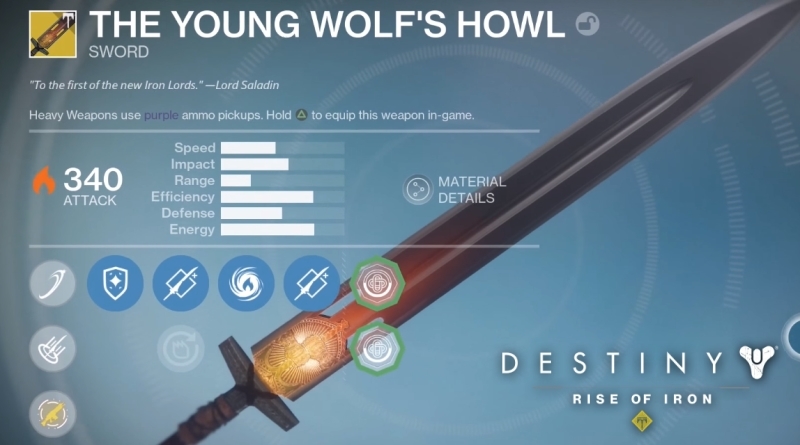 Young Wolf’s Howl Sword uses very heavy ammo and it does a Solar damage. This exotic sword is pretty quicker than the old ones and has an amazing moveset. There are total of 3 skins for Young Wolf’s Howl Sword. You will get the default as a reward and the other two has to be unlock using ornaments. The names of these two skins are Born in Fire and The Wolves Remember. These two appearances have pretty great look and I know most of you will definitely have hard time choosing an appearance. 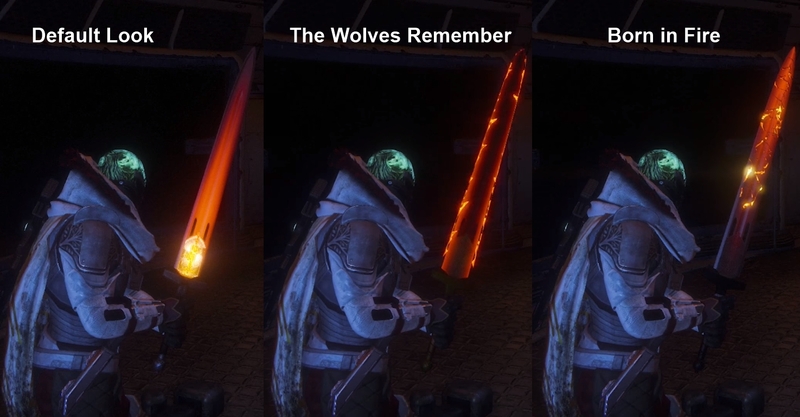 Below are the different variations of Young Wolf’s Howl Sword. To get the above Born in Fire and The Wolves Remember looks you need to get the ornaments, and to get ornaments you will have to obtain Radiant Treasure. Because There is a limit on how much Radiant Treasure you can get every week. You may have to grind for some time until you get any of these 2 skins.